That drumbeat coinciding with your own heartbeat is the heart of every song in every rock concert. It is a delight to every rock fan, but little did we know that the drummer himself ain’t feeling it at all. From the drummer’s perspective, everything is a poxy, paper-thin, bassless pop from a tiny onstage foldback speaker. Trying desperately to feel the bass, they often turn the onstage monitors up to ear-splitting volumes, but you just can’t get that kind of low end out of small speakers. Here is where the BC2 Bum Chum comes in. It literally syncs the beats with a vibrating seat so the drummer can get into the groove. These sounds are heard as sub-bass by the ears. So this way, the drummer can hear the sound without the ear popping volume onstage. The set-up is fairly simple. You run your bass mic staright to the BC2 control box. There’s a signal splitter inside that runs a clean signal out again to the sound desk, and another signal up into the throne. If you’re using electronic drums, there’s a line level input as well. And if your sound guy complains for some reason, you can take an XLR feed back from the desk or monitor channels as well. This may rock, but it sin’t cheap. 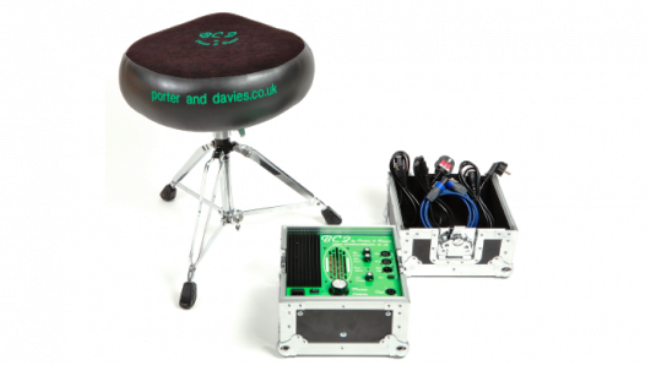 – it costs £799 (US$1275) as a complete kit from the Porter and Davies online store. The slightly stripped down version – the BC Gigster – has also been added to the range at a price of £599 (US$950).